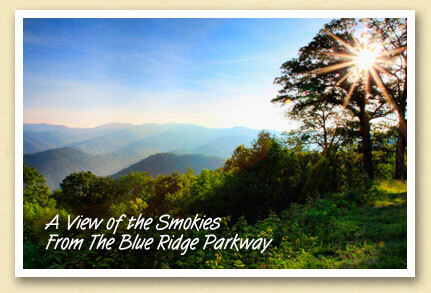 Postcards From The Smokies » Get a Load of This Curvaceous 75 Year-old Beauty! Get a Load of This Curvaceous 75 Year-old Beauty! The Blue Ridge Parkway turns 75 this year and it’s as gorgeous as ever, with unmatched views of Appalachia. “America’s Favorite Drive” stretches 470 miles from the Shehandoah National Park in Virginia to the Great Smoky Mountains National Park in North Carolina. We’re a little prejudiced of course, but we believe the rugged southern section is the most scenic. In fact, the 90 mile drive from Cherokee to Asheville will take you to the highest point on the Parkway at Richland Balsam. It’s a great day trip from the Bryson City / Cherokee area. Download a pdf map of the Blue Ridge Parkway. Photo by Shari Jardina, an Indianapolis photographer who’s captured many images of the North Carolina Smokies.